You were a dream once, now you’re a memory. Nusa Penida, Indonesia is an island in the southeastern side of Bali separated by Badung Strait . It is a part of district of Klungkung Regency that includes the neighbouring small island ofNusa Lembongan . 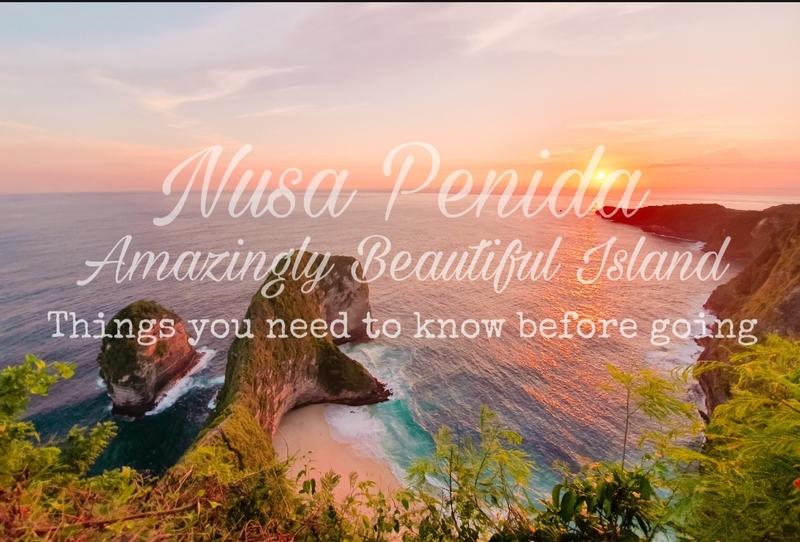 Years ago Nusa Penida was on my bucket list of “Places to go to”. Now I’ve ticked it off, and it was an awesome feeling. It wasn’t the easiest to go to though, the drive was terrible. It was long, agonizing hours on a bike driving through very narrow roads. Twists and turns, ups and downs. The journey was so difficult that I almost decided not to continue. But I’ve longed to see it, I have got to see it! So I continued driving on these awful roads, massive holes, some didn’t even look like roads anymore. It was more like driving through a dried-out river with stones, sand, and mini cliffs. But boy, I’m glad I continued. Oh the view was great from up here. And the sunset, it was just perfect. Gazing upon it from above was surreal. It was unbelieveable, like I was living in a dream. It was exactly what I expected it to be. Breathtakingly beautiful and undeniably amazing. It was almost sunset and that made it more appealing, it added drama to the moment and perfection to the view. Soon enough it’s beauty was covered with darkness and I went home with a grateful heart. I lost count of how many stairs there were, I am pretty sure though it is over 500. That was the time I sat, tongue out. I am out of shape. Motor bike – is always the go-to vihecle for exploring, it gets you from one place to another easily and quickly. Just always drive safe and use helmets. There were multiple blind curves, the roads are narrow and sometimes there are huge holes in the middle of it. I recommend avoid driving at night. Car Service (Alternative) – Arrange car through your hotel, they normally offer per day charges depending on the destination you are going. It’s less hassle but could sometimes hard to go around as the roads are very narrow. When snorkeling at the Manta point it is to best leave early, it tends to get really crowded on a later time, hence lesser chances of you seeing the manta rays. On your way to Nusa Penida, I suggest you be at the port early, tide tends to go up , there could be big waves and also the port don’t have any ramp during onboarding. It is a water entry; flip flops are recommended. Always wear sun protection, I use Garnier SPF50 sunblock lotion and also wear rash gaurd if you have sensitive skin, protection for jellyfish sting. Manta rays frequent Manta bay but it’s not really everyday. Luckily I was one of the lucky few. Check out these website when booking ferry ticket Sanur-Nusa Penida & vice versa; Marlin Fast Boat, Crown Fast Cruises, Sugriwa Express , 12Go , the latter one has the Cheapest fare compared to booking it directly to the ferry company. I stayed in Prasi Sunset Bungalows – Tripadvisor , Prasi Sunset Bungalows – Booking.com , Check the link to see reviews and pictures of the place. Definitely worth it. The place was quite nice, friendly, accommodating and warm crew, the stay was pleasant. They made sure that your is experience great. They arranged car pick up upon arrival and departure, motor rental at the hotel, the boat rental for snorkeling with Manta ray among other water activities. And made the ferry reservation from Nusa Penida to Lombok via Padang Bai and the GIli Island . The view from the villa was lovely, overlooking the sea and great vantage point to see Mt. Agung . It has pool, hot water, Wi-Fi, and breakfast included. If you want more details about the place send a message to Wyn Adnyana , he’s the one who’s taking charge of the hotel. Virgin Beach Restaurant – was the one restaurant that got stuck in my head. I liked there tuna steak not only because I haven’t eaten seafood for the longest time, but because it tasted amazing and the seasoning was perfect. It was a pleasant meal. If this article has been VERY helpful, please click subscribe and share! If you just like this post, please don’t forget to follow and like. See you on social media, my accounts are: Facebook – Novas Travel Adventure , Nova Montejo , Instragram – dreads.on.adventure . Spread good vibes and cheers to more travels!! !